In 2016, the Trails series became a personal savior of JRPGs, thanks to its intriguing lore, fun battle system, and sharp writing—proving the genre still appeals to this jaded player. Spending time with Trails of Cold Steel II at E3 solidified that. But I’m not the only one with love for Cold Steel’s Class VII. Falcom’s turn-based JRPG, The Legend of Heroes: Trails of Cold Steel, ended on an intense cliffhanger. When the title released last December in the West, I invested about 85 hours to see its story through. I was enamoured by the game’s political implications, its connections to the greater Trails series universe, and its fresh-faced students of Thors Military Academy exploring their worth and idealistic motivations in a military-based and class structured reality. I also admit that I was blindsided by its final plot twist and I became hooked. 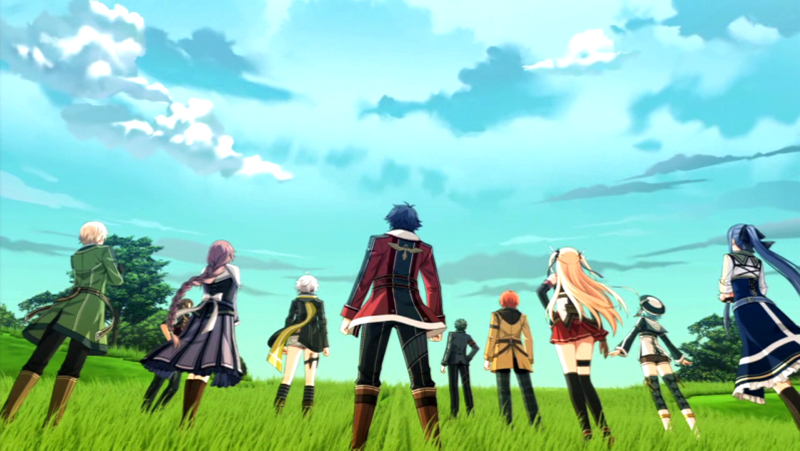 As publisher XSEED Games had some PS3 demo stations for its direct sequel, The Legend of Heroes: Trails of Cold Steel II available at E3 last week, I couldn’t pass up the chance to check in with its main character Rean and the rest of Class VII. What was even cooler was that all the games on their show floor were shown by XSEED staff members. I had the opportunity to chat with Nick Colucci, who was the main localization editor on the first Cold Steel game. I spent a lot of time mucking around as Rean on the first day I visited their booth. For half an hour or so, I exhausted my bonding points with some members of my team in a snow-laden town. In Cold Steel, bonding points are the equivalent to the Persona series’ Social Link mechanic. Every in-game day, Rean gets a set number which players can use to build up party member relationships with whomever players choose. Doing so is beneficial to enhance special attacks in combat, and they’re generally a fun way to trigger events that delve deeper into each character’s history. The feature makes a return for Cold Steel II, and I should warn there’s some vague spoiler territory upcoming. I’ll do my best to not go into too much detail, however. The Cold Steel II demo captured just a fraction of the game, and was a little past the prologue. Colucci stated that the translation on the demo was the Localization Team’s first pass (note: Brittany Avery is the lead editor on Cold Steel II), so if anything seemed out of place, then that would be the reason. There was nothing from what I read that was out of the ordinary, and XSEED, from what I could tell thus far, is doing a great job as I’ve come to expect. The volume of text was staggering and still so impressive. I dug really deep into game’s notes detailing the prologue, and subsequent adventures and quests up until that point in the demo. I found out all sorts of lovely spoiler-y bits which I won’t go in-depth here, and definitely nothing XSEED hasn’t already made public via promotional material and the latest trailer. It’s worth mentioning that one of the game’s primary objectives of Cold Steel II is to reunite Rean with his classmates. That shouldn’t come as a surprise given how the first game ended. What was interesting to me were the expanded fighting members to the main cast. There were many familiar faces as part of the main fighting crew—some who weren’t part of the core group in the first game. And while I didn’t actually notice any completely new character in my fighting and traveling group, I did see some really cool people in the supporting cast profiles menu, namely Thors Academy attendees. However, the ones who joined the main party, and how their roles changed from the events of the first game was really fun to read up on, too. Of course, it’s hard to tell exactly what’s going on but it looks like Class VII gets a lot more help from former allies. How their backstories align with current events in Erebonia has me eagerly anticipating all those finer story details when Cold Steel II releases. There was a lot of information to explore in the main menus, and I’m happy to report that so much happened during the events between the first and second games, and at the start of the latter. The Empire of Erebonia is in a state of chaos following Cold Steel’s crazy ending, leading to a civil war. The political aspect of the games—which makes them so rich and sets them apart from so many JRPGs for having a more grounded narrative—seems to be front and center in Cold Steel II. But don’t worry! All the cool magic hints from the first game are addressed in some form, from what I could tell, too, by that point of the demo. Overall though, there’s a lot of ground to cover, and from what I read, there were a lot more questions unraveling from the aftermath of the first game. The menus were familiar as with the previous game, with all the sepith (magic artes) to manage, plus tabs for recipes, fishing, main quests, sidequests and more accounted for. During my time, I got to see some characters’ S-breaks (powerful specialized attacks unique to each character), and they are as spectacular as ever. Battles also generally ran the same as Cold Steel. The Link Combat system was there with critical hits allowing party members to jump in for supporting follow up attacks. There’s a new mode called ‘Overdrive’, which is supposed to allow linked characters to attack for up to three turns in a row. I didn’t get to test it in full, however, because I was too busy obliterating my enemies using my S-breaks. A couple of other things did stand out during my time with the demo. The first was a mini-snowboarding game. I got the same joy playing it as I did back when Final Fantasy VII released and I reveled in snowboarding antics in that game, which is to say it’s simple but fun. Colucci said a couple of guys had come over to the booth and created a snowboarding competition between themselves, which was fun for him to witness. The other interesting thing about the demo and time I spent with Colucci as I rummaged through the game’s menus, wasn’t anything the game itself offered. What really struck me was just how lovingly Colucci spoke about the project, and the game’s characters. It felt like a fan-to-fan, easy going conversation. When he mentioned that he was not the main editor on Cold Steel II, he relayed his emotions when he handed the project over, which came with a re-enactment of a dramatic gesture and a playful outcry to take care of his Cold Steel ‘children’. It was clear to me in that moment, just how incredibly emotionally invested Colucci was in the localization process of the first game. He divulged that the Board Meeting scene from the Cold Steel was one of the hardest to work on, and that the biggest task was translating it to be as fluid and natural sounding as possible while keeping it interesting. He joked that being in many board meetings of his own helped with that. From a personal perspective, I had fun getting to know the characters from the first game, and had a ‘nerd’ moment with Colucci. In Cold Steel, players can trigger an event to determine which of the class members you could dance with at the school’s festival, which eventually unlocks a scene with that character in the closing moments of the first game. Colucci asked which event I received, and I told him I went with Fie. I asked him which girl he would have gone for, and he said Laura would probably have been his choice for how awesome her scene was. He also mentioned that he enjoyed Emma’s character, but understood that Emma—thanks to her huge reveal at the end—didn’t get to have as much character development throughout the first game in order for the story to keep her identity a secret. In another moment, he watched me engage in Cold Steel II’s cooking feature, which is done in the game’s main menu, just as in the previous installment. He noted that he laughs when Millium cooks up something crazy, as she gleefully exclaims a line about providing death to the masses. I can confirm it was pretty funny, as I had her butcher a meal into something questionable. That’s the sort of fun Cold Steel has, even for a game with a more serious driven-story. It’s one of the things that makes the series so good for finding that balance, and it was cool to see Colucci’s excitement for this seemingly small touch. Having the opportunity to chat some with XSEED’s Nick Colucci made me even more excited to get a first-hand glimpse of how much love and care goes into translating Falcom’s wonderful series, and how fortunate we are to be able to experience it in the West. There’s a bit more I could go into in detail in from the demo but as I mentioned, the spoilers would be plentiful. Ultimately, what I can say is that I can’t wait for Trails of Cold Steel II, which is currently slated for a PS3 and PSVita release this Fall. It looks great, has all that’s familiar from the first game, and I’m betting there’s going to be a lot to take in story-wise based on what I managed to get a peek at. I look forward to delving back into its intricate world.